As I mentioned in my previous post, I found some fairly similar fabric at crappy Joann’s! It’s a wool tweed with coppery metallic threads running through it. It had an okay drape – but stiff enough for a jacket. I starting cutting out the pattern pieces I would need for the project. In terms of the peplum at the bottom, it needed to be more frilly and less fitted than the pattern I was using – as well as being on the bias. 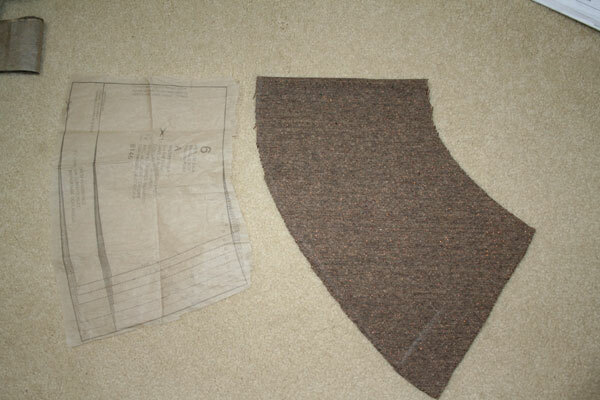 The back piece would need to be longer to allow room for the inverted pleat. In the photo I have the original pattern piece and what I ended up cutting. I came up with the piece mostly from draping it onto the dressform and pinning the inverted pleat. The roundness of the pattern piece as opposed to the original makes it on the bias and with a bit of a ‘frilly-ness’ when it is attached.